I’m often asked what I eat for breakfast. It can be hard for some people to imagine the first meal of the day without dairy and eggs. Breakfast is my favorite meal of the day and I never tire of all the amazing vegan options to choose from. Smoothies, tofu scrambles, pancakes, waffles, avocado toast, spicy tempeh and potato hash, lemon blueberry loaf and banana muffins come to mind. 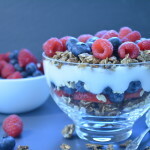 But my very favorite is oatmeal and if I want to jazz it up, I add some homemade granola, berries and coconut or almond yogurt. This vegan, plant-based granola is easy to make and very healthy. It is iron rich due to the seeds, dried fruit and blackstrap molasses. The granola also contains rolled oats that are beneficial for lowering cholesterol and improving hearth health. We always have a batch of it on hand and it keeps for a week or so in an air tight container like this. My husband is a triathlete and Iron Man who competes at the world championship level. He loves this granola for breakfast or a pre or post training snack. For breakfast, he will mix it with some non-dairy milk, fresh or frozen (and defrosted) fruit, flax seed meal, rolled oats, cinnamon and maple syrup for a touch more sweetness. It’s so much a part of his morning routine, he could prepare this breakfast bowl in his sleep. Once you know the “formula” for making granola, you can customize a recipe of your own. Basically, you want to mix 6 parts “dry” ingredients with 1 part “wet” ingredients. Some examples of dry ingredients are: oats, nuts, seeds, dried fruit, coconut flakes, almond meal and spices. Some wet ingredients are: maple syrup, agave, molasses (this can be bitter so you might like to go easy), tahini and apple sauce. 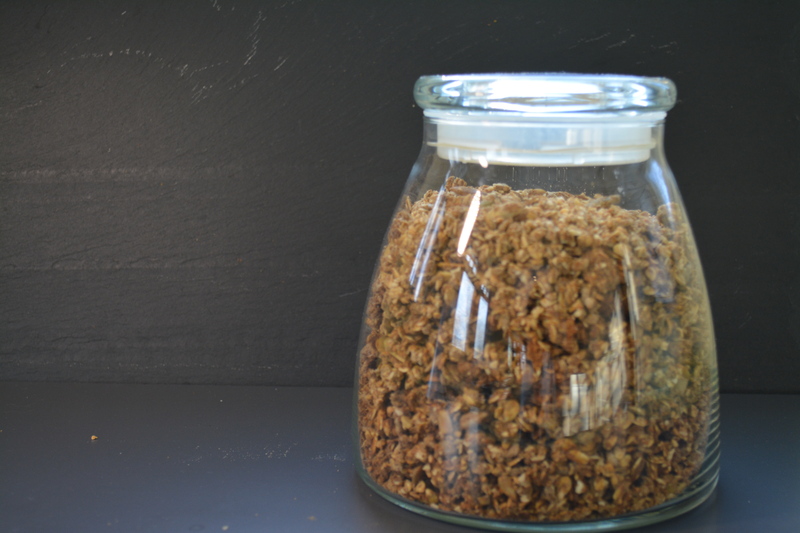 In this video I demonstrate the preparation of the granola, and elaborate on the formula. This vegan, plant-based granola is easy to make and very healthy. It is iron rich due to the seeds, dried fruit and blackstrap molasses. 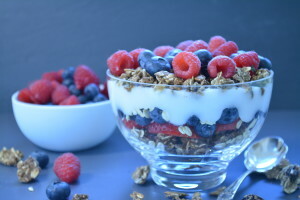 The granola also contains rolled oats that are beneficial for lowering cholesterol and improving heart health. Add the wet ingredients (the last three) and stir until well combined. Add more maple syrup, one tablespoon at a time, if needed. Remove the baking sheet from the oven and move the granola on the outside of the sheet to the center and vise versa. I use almond meal that is left-over from making almond milk. So, it is quite wet to begin with. If you are using a dry almond meal, the cooking times will be on the shorter side. If using one that is remaining from almond milk production and therefore wet, they will be on the longer side. Yum! This looks a lot like our go-to homemade granola (though all my dry ingredients are doubled for that amount of syrup, and I use a cup each of pumpkin, sesame and sunflower seeds), except that I add half a cup of either tahini (which really ups the mineral content, especially calcium) or peanut butter to the syrup and spices. Hi Ellen- Thanks for sharing your recipe. It sounds like you don’t follow the 6:1 ration of wet to dry ingredients but still have success. I’m going to try tahini or a nut butter next time I make it. Dan has a very sweet tooth and loves the granola this way but I’d like to try your high mineral variation. I watched your granola video today. I think they are informative, inspiring and entertaining! Well done. I made it this afternoon. Here are my comments: i cooked it for 65 min at 300. Burnt it slightly. I used cherries and chopped apricots. Next time I’ll skip the molasses – too strong a taste for me. I’ll tweak it and try again soon. Keep the videos coming! Hi! Yes, the black strap molasses has a bitter (and I think a bit sour) taste. We really like the flavor that it adds but certainly skipping it and perhaps replacing it with another “liquid” would work well. I’ll bet the apricots were great…and it can take a few trials to get the cooking time right. Thanks for letting me know how it went and about your recipe tweaks! Thank you for this feedback, Elizabeth. I use almond meal that is left-over from making almond milk. So, it is quite wet to begin with. If you are using a dry almond meal, the cooking times will be on the shorter side. If using one that is remaining from almond milk production and therefore wet, they will be on the longer side. I updated the times in the recipe to reflect this. Thanks for the heads up! I also had found and like this granola – http://ohsheglows.com/2011/01/04/my-favourite-homemade-granola-to-date/ – although I think it’s too sweet and I reduce the sweeteners and add a little more peanut butter. I love that all those modifications can be made and as long as the basic formula is followed, the result is still good. Thanks for the link to the Oh She Goes granola. I love Angela’s recipes. I’m going to check it out. I made this last night and LOVED it! I substituted sunflower seeds instead of pumpkin seeds and had to omit the coconut flakes so my husband could enjoy this too. I thought the ratio of dry to wet ingredients were great and could have baked for a little less time but unsure how to gage the timing. Nevertheless, it was a hit!! LOVE! LOVE! LOVE! SO glad you loved it, Barb!! I use almond meal that is left-over from making almond milk. So, it is quite wet to begin with. If you are using a dry almond meal, the cooking times will be on the shorter side. If using one that is remaining from almond milk production and therefore wet, they will be on the longer side. I updated the times in the recipe to reflect this. Thanks for the heads up! Hi, Diane! Thanks so much for the yummy healthy granola! Can I substitute half or more of the maple syrup for organic coconut nectar? Or maybe honey. Where I come from honey is part of plant based eating, but if it causes offense please disregard. No offense Marie. 🙂 Yes, you can make those substitutions. Enjoy!